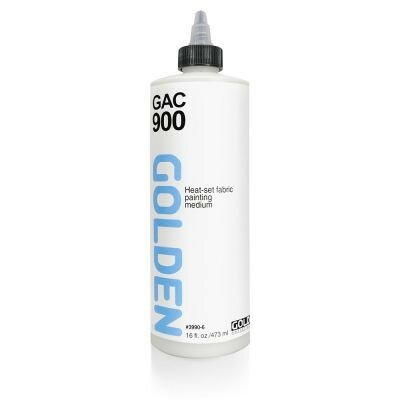 GAC 900 Heat Set Fabric Painting Medium, when heat-set properly, offers a very soft hand and laundering stability. Mix with High Flow Acrylics to produce "tie-dye" effects, or blend with GOLDEN Heavy Body, Matte or Fluid Acrylics for brush or screen application. GAC (short for Golden Artist Colours) Specialty Acrylic Polymers are based on 100% acrylic polymer emulsions. The GACs are useful as mediums or modifiers of acrylic paints. GACs can be used to extend acrylic colours, to regulate transparency, create glazes, increase gloss, reduce viscosity or improve adhesion and film integrity. GAC polymers can also be used for binding pigment solids for various effects and surfaces. Unlike the other GOLDEN Mediums and Gels, GAC Acrylic Polymers have only a minimum amount of thickeners, levelers, defoamers and surfactants to ensure good film formation. The consistency of the GAC polymers is more fluid and thin than other GOLDEN Mediums, so they will reduce the thickness of most GOLDEN Acrylic Paints. GOLDEN Fluid Acrylics are slightly thicker than the GACs, but will exhibit less change in viscosity with the addition of a GAC polymer. Each GAC is a unique polymer with unique benefits and applications. Refer to the product descriptions below to find the proper medium for a particular applications.